Trim excess fat from chicken breasts. In a large pot, add chicken and fill the pot with enough water to cover the chicken by an inch. Add 1 tablespoon of salt and a teaspoon of pepper. Bring to a boil and reduce heat so that the liquid is still simmering - just hot enough for bubbles to barely break the surface. Cover pot and continue to cook for about 8-10 minutes, or until a meat thermometer reads 165 degrees. Meanwhile, in a large bowl, combine pesto, Greek yogurt and 1/2 teaspoon salt then set aside. Rough chop the sun-dried tomatoes. Once cooked, remove chicken from the pot and allow to cool. Chop into 1/2-inch pieces - or adjust the size as you prefer. Add chicken and sun-dried tomatoes to the yogurt/pesto mixture, and combine thoroughly. 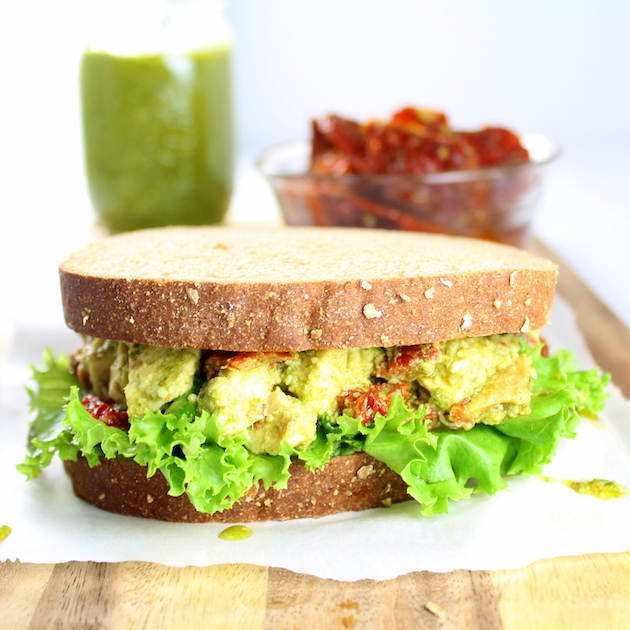 Rinse/dry lettuce, then build sandwiches to your liking using the sun-dried pesto chicken, lettuce, and Harvest BlendsTM Sprouted Grain bread! Recipe Notes: When mixing the yogurt and pesto it may seem that the two ingredients separate. This won't impact the finished product - when everything is mixed it comes together nicely. To minimize this effect you can blend the two ingredients in a food processor for a few minutes. 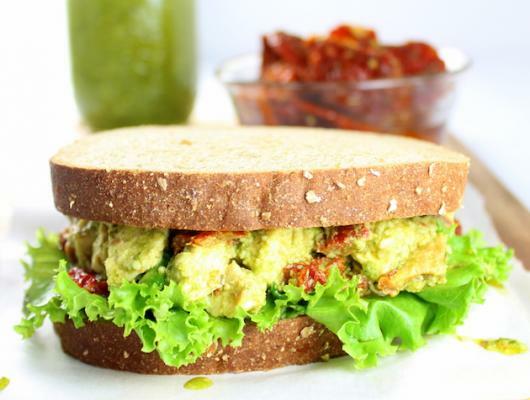 Sprouted Grain Chicken Pesto Sandwich - taking chicken salad to a whole notha’ level w/some sun-dried tomatoes, basil pesto & Greek yogurt.